Fred and I were lucky enough to spend a week in Memphis, Tennessee at the beginning of April this year. 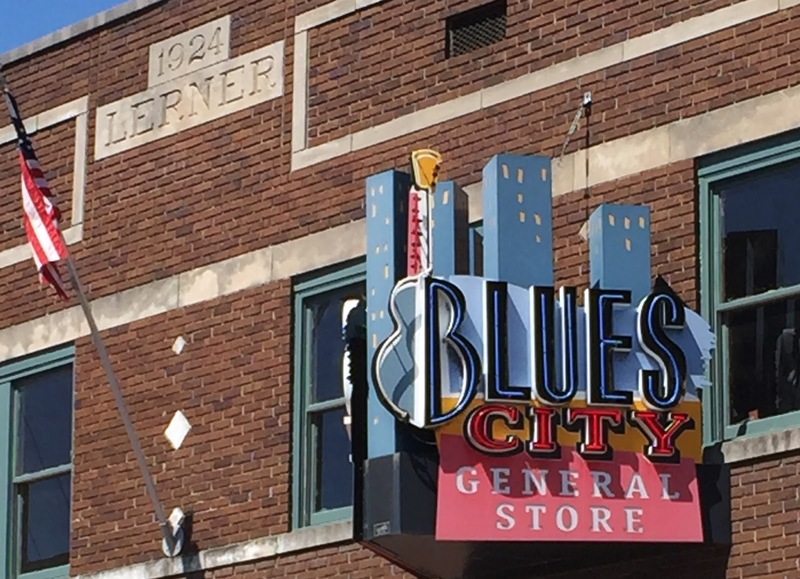 Memphis is a unique and wonderful place full of history, music and barbecue. Neither of us had visited this area before so we looked around for camping advice. We were unanimously told to try the Tom Sawyer RV Park in West Memphis. We are so glad that we did. Tom Sawyer is located right on the Mississippi River. Our Riverfront campsite allowed us to watch barges and steam powered paddle-wheelers fight the current up and down the river. The river was running a little high but not so high that we had to worry about flooding. Interestingly the RV park has high water flood marks on many of their buildings from prior years. Their website even provides a link to the National Weather Service Flood Stage listings for the lower Mississippi River. 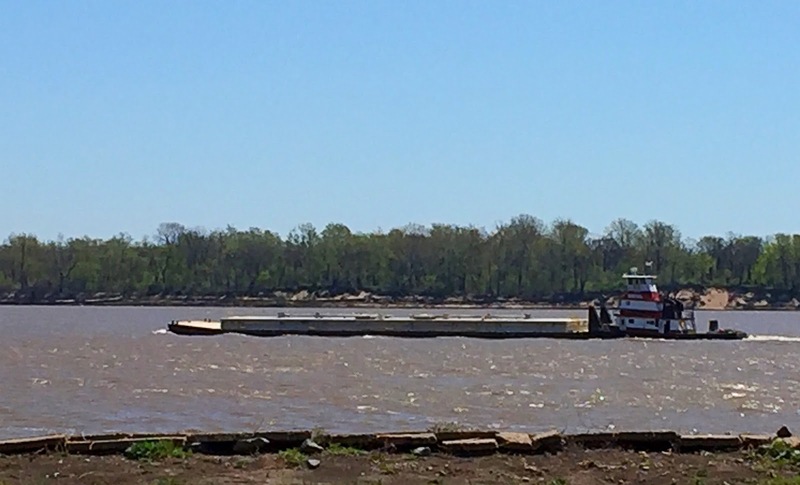 The RV Park has battled the river on a number of occasions. We are glad that they are willing to do so because our stay at Tom Sawyer was a treat. Tom Sawyer boasts a number of tree houses from rustic to elaborate that were a pleasure to look at. The RV Park is located not far from Memphis proper. It took us about 20 minutes to cross the new bridge and be right downtown. Crossing the bridge it is hard not to notice a giant silver pyramid shaped building. It is a huge Bass Pro Shop with a store on the ground floor and restaurant and hotel on the upper floor. There is an open elevator that you can take to the top for a birds eye view. Our first stop was Beale Street, home of the Blues, that place where Rock and Roll and Soul Music came together and music was King. Elvis was here. Johnny Cash and Roy Orbison and Jerry Lee Lewis all recorded here on the Sun Records label. Beale Street starts at the Mississippi River and travels for about 2 miles. We found it full of Jazz clubs, restaurants, kitchy souvenir shops and museums. 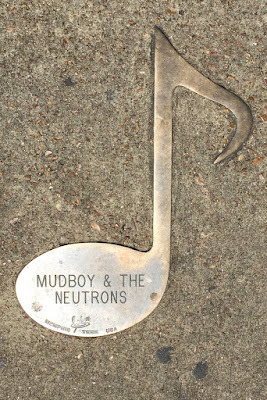 Walk the street at any time of the day or night and you can hear music spilling out onto the sidewalk. It was hard for us to travel more than half a block without stopping to hear "the rest of this set" or "this song and then we'll go". Sidewalks on Beale Street are dotted with brass musical notes. Each note is inscribed with the name of a musician whose work has become part of Memphis history. 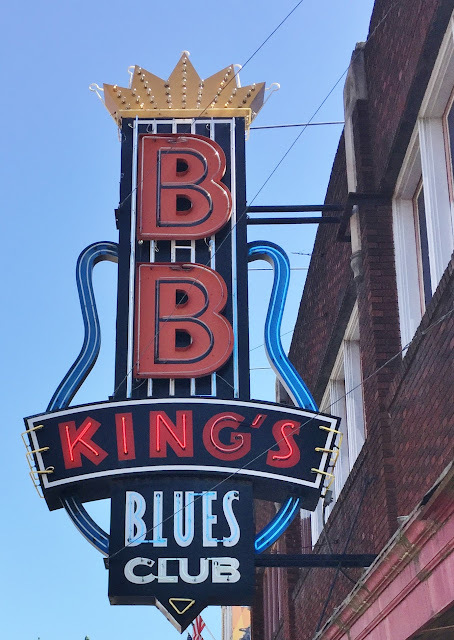 We stopped at BB King's for a late lunch, where we met a charming waitress named Natalie who introduced the chef to us since he was "from New York too". Chef served us hummus made from black eyed peas along with some of the best Barbecued Pork and Brisket we have ever tasted. Did I forget to mention Hus Puppies? Those golden nuggets of cornbread that I remember from my southern childhood were every bit as good as I had remembered. It turns out that Chef was from Brant Lake New York, a tiny Adirondack hamlet not far from our own home base. He got his start at Jimbo's a favorite for locals and Adirondack Vacationers. The Rock and Soul Museum rounded out our first day in Memphis. This small but powerful Museum was created by the Smithsonian. The museum tour begins with a short film about the history of music in Memphis. We were then issued headsets and controllers that allowed us to customize our museum experience by choosing from a list of musical selections that was associated with each exhibit. 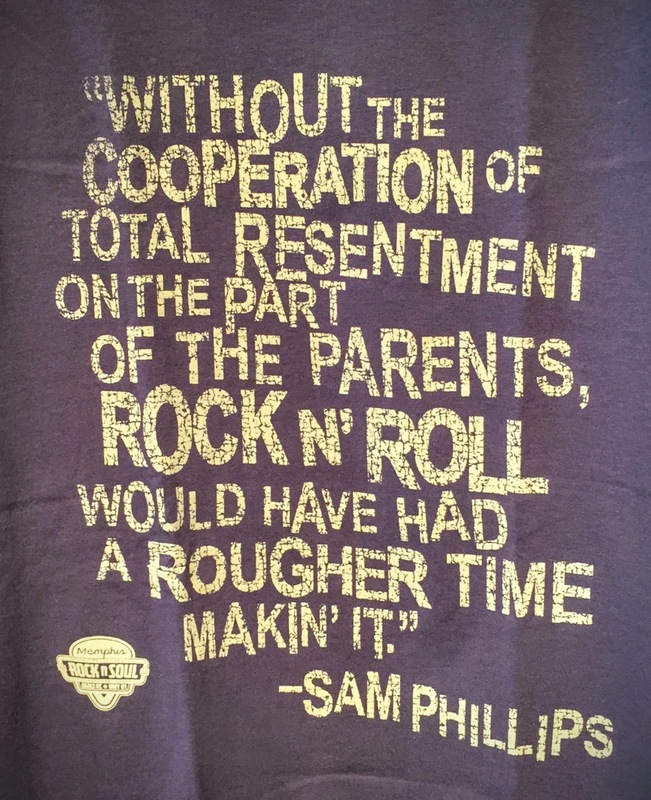 The exhibits ranged from the front porch rocking chair of a gospel singer through stage costumes worn by Elvis and Jerry Lee Lewis. Trunks and cases of band equipment marked property of Isaac Hayes were set out in several places making it seem like the Soul Man was lurking about getting ready to perform. The last room was a collection of framed Life Magazine photographs that seemed to capture the spirit of the performer it portrayed. It was an amazing interactive experience that had every person in the room tapping swaying or dancing to the tunes they had chosen to personalize their experience. It was a delightful way to spend the afternoon. We found our way further East in the city on our second visit to Memphis. Central BBQ is still in the downtown area and is located one street over from the National Civil Rights Museum. When we asked people at the campground where to go for good Barbecue Central is where they sent us. Fred and I had been eating slow smoked Texas style barbecue all Winter and wanted to see what Memphis offered in comparison. We enjoyed the pulled pork, ribs and brisket along with a sample of smoked sausage. Central also offers turkey and chicken. They are proud of their smoked hot wings and barbecued bologna too. Pork rules in Memphis BBQ. We were given the choice of wet or dry and allowed extra bark if we wanted it and of course I did. The sauces were vinegary but pleasant and very different from the brown sugar sweetness had become accustomed to in Texas. Bellies full we decided to walk awhile and headed over to the Lorraine Motel home to the National Civil Rights Museum. The Lorraine looks as it did in 1968 when Dr. Martin Luther King was assassinated here on the balcony outside room 307. Two white Cadillacs are parked beneath the balcony of that room. The museum consists of the Motel and the Young and Morrow Building across the street, a former boarding house where James Earl Ray fired the shot that murdered Dr. King. The Young and Morrow Building houses the volumes of investigative paperwork that was generated by Dr. King's death. Exhibits include a replica of Montgomery City bus that tells the story of Rosa Parks and the Montgomery Bus Boycott, a whites only lunch counter from Greensboro North Carolina to remind us that sit-ins were an effective form of non-violent protest and a replica Sanitation truck from the 1960's that reminds us that Dr King was in Memphis to support fair and equitable wages for black sanitation workers. "I may not get there with you but I want you to know that we as a people will get to the promised land."